Martine Bedin's (b.1957) contributions to Memphis were primarily in the area of lighting and graphic design. Born and raised in Bordeaux (where she was a friend of Memphis colleague Nathalie du Pasquier), Bedin moved to Florence in 1978 to study architecture with Adolfo Natalini of Superstudio. In 1979 she contributed an installation entitled La Casa Decorata to the Milan Furniture fair, and she met Ettore Sottsass Jr. the following year, leading to an invitation to join Memphis; she also introduced du Pasquier to the group. Among Bedin's contributions to Memphis in its first year (1981) was this iconic Super lamp. This version is the initial prototype and was shown at the first Memphis exhibition at the gallery, Arc 74 in 1981. Table lamp in sheet steel surmounted by six light sockets. The body is formed of two, stamped, semi-circular sections, painted blue, joined together along the centre. The base is a flat rectangular sheet of blue painted metal, the body is supported at each corner by a steel wheel with a rubber tyre, painted black. The light sockets, sheathed in steel collars in a variety of primary colours, are arranged equidistantly along the curved edge. The electrical cable is sheathed in black plastic. Studied architecture in Bordeaux, and then got a scholarship to travel to Florence to continue studies there in 1976. She was furnished with a recommendation from Marco Zanuso Sr. When she arrived, 'it was the dark years in Italy' and universities were shut down due to strikes; terrorism was also a constant threat. She was 19 years old and 'dying for someone to teach something to me'. She met Adolfo Natalini (of Superstudio) and became an assistant in his studio. This exposed her to radical Italian design for the first time, though she says that at first she was 'just an observer'. Through Natalini she was invited to design a house installation for the 1979 Triennale, the first instalment of the series after it had been closed down. This was the Casa Decorata. It attracted the attention of Ettore Sottsass and Michele de Lucchi - she met them both in 1979. At this time she had returned to Paris to continue her studies under Jean Nouvel (with whom she continues to work to this day), but ES visited her there and persuaded her to return to Italy: 'there’s nothing interesting in Paris, come to Milano'. Bedin jokes that 'he completely corrupted me!' She joined Sottsass’s studio, 'working all through the day, all evening, into the night, drinking and talking'. Bedin introduced Nathalie du Pasquier to the Memphis group - she had known her in Bordeaux and they became reacquainted in Milan. Since the Memphis years, Bedin has operated more as an artist than as a designer. She left Milan in 1990, and now lives in both Rome and Paris. Up until last year she ran an itinerant university of sorts called the Observatoire de l’Objet, trying to get young design students to 'think differently'. (She will send documentation on this project.) She is represented by the Pierre Marie Giraud Gallery in Brussels. 'Memphis was really like a family,’ says Bedin, ‘very intimate - a close microcosm of friends’. The first laminate pieces were made by Abet in the summer of 1981, at their factory near Lake Como; she says that sometimes you can recognize the first run of production because there were lots of mosquitos in the air and they occasionally ended up trapped in the laminates. Bedin designed the poster for the exhibition. She remembers going by taxi to the first Memphis exhibition, at the shop Arc 74 in Milan, and being hardly able to get to the shop because of the crowds and traffic: ‘We thought it was a terrorist bomb!’ Bedin was also struck by the rapid influence of the group in its first year. Members received many drawings, through the post and at conferences, some by children, with requests that the designs be put into production. Once the group got going there was a sense of having to continue the momentum, but no financial success to speak of: ‘We were afraid for the second collection. I do not understand how we were living; we were not making any money. [Sottsass] was not doing any art direction – he was not giving input. Just draw as much as possible, do your research’. … ‘None of us were making money at this time – we were not thinking of the price of these things’. She is under the impression that the first collection was shown at Arc 74 without a price list even being drawn up. In 1982, Ernesto Gismondi of Artemide took over Memphis as a company; it was at this point that the group began working in other materials such as glass, ceramics, and marble. Bedin was especially interested in marble – pieces were fabricated by Ultima Edizione in Carrara (the firm closed recently, and Ernest Mourmans acquired its collection). In 1983, ‘we began to have troubles'. By this point Gismondi was acting as a manager, trying to direct the group to make less heavy, less expensive objects. ‘We began to resist. The youngest, like myself, didn't understand [commercial considerations] – I didn't have any culture of industry'. Sottsass was also concerned: ‘We should be careful not to be eaten by the company’. There was also the rapid appearance of what the group called ‘FM’ (for Fake Memphis) in design worldwide. This presented a challenge to the group – should they continue as they were happy to do, retaining their design sensibility, or change course? Eventually at a weekend conference held by the group in 1987 (or possibly 1986? ), Sottsass announced that as far as he was concerned it was over: ‘Look kids, I am getting out of Memphis. We can't do avant garde for years and years’. ‘That made an incredible reaction – very Commedia dell’Arte, very Italian, though we weren't all Italian. DeLucchi, who has a very low voice, was screaming at him: Ettore, you can't leave us!... And Ettore said, it’s like a love story. When you get used to it, you have to quit’. So the group dissolved. They made a deal with Gismondi that ‘gave him as a present the name of Memphis,’ under the condition that he not show other designers under the name. In return, they promised not to form a new group – even of only 3 or 4 of the designers. Gismondi went on to sell the company to Alberto Albricci, who still owns it now; ‘he never understood Memphis really but he continued to sell it,’ which shows a certain commitment that she respects. Bedin was responsible for most of the lighting in the first Memphis show. She had experience with this because her father was an engineer, and so she ‘was playing with forbidden things – electricity. I was a mechano’. The Casa Decorativa also had featured her lighting designs. She says that in her lighting, she may have departed from ‘the idea of decoration of Memphis’ that the other designers had: ‘I was very interested in working in decoration through structure and the building of things. What gives pattern and decoration in my lamps is the way of building them – the cables etc'. Bedin’s and other light metalwork for Memphis were done at a family workshop run by Sigh. Marino Celt, which was an artisanal fabricator for Artemide (the lighting firm co-founded by Ernesto Gismondi, which employed Sottsass and DeLucchi as designers). Bedin was entrusted with oversight of the fabrication of Memphis lighting, both of her own and other members’ design. 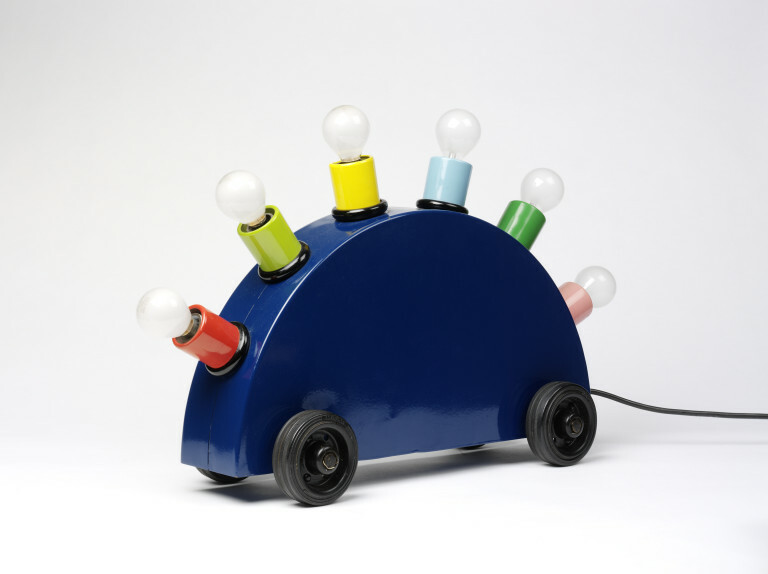 The Super lamp, of which Bedin still owns the original prototype (made in steel with ready made wheels nailed to the bottom – exhibited in the 1981 show at Arc 74), was inspired by her travels since childhood. She designed it long before Memphis formed, probably in 1977. When Sottsass first saw the drawing he asked her to explain it, and she talked about wanting to design furniture she could take with her anywhere – ‘I can carry it behind me, like a dog He was taken by the naive ‘immaturity’ of this idea and encouraged her to include the design in the exhibition. (She believes that Sottsass included so many young people in Memphis ‘because we were pure – we had pure energy. He was getting old; this was what he got from us’). This was typical of the first Memphis collection: many of the designs had been developed by members in previous years, and were all brought to the table. The same is true of the Terminus lamp that the V&A has acquired; it was based on drawings of furnishings with shoes, socks etc that Bedin had done as an architecture student. She was very interested in anthropomorphism – the idea of ‘furniture who were like friends. They could even give you the idea that during the day they were doing something else’. In addition to the above-mentioned Super lamp prototype, Bedin has one of her own Memphis lamps (entitled Holiday), a small table by Traumata and some Sottsass objects. She also has sketches and technical drawings for her Memphis work. These are split between her home in Paris – she recently had an exhibition of drawings there – and her archive which is in Corsica. 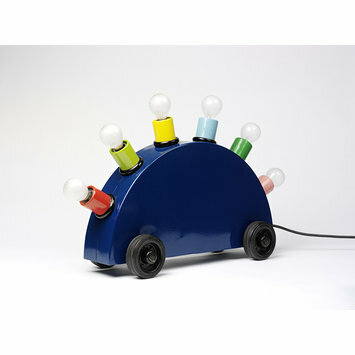 Lamp, painted sheet steel mounted with lighting components, designed by Martine Bedin for Memphis, made by Fausto Celatti, Milan, Italy, 1981. Catherine Rossi, "How Memphis was Made" in Crafts Magazine, ed. Grant Gibson, London, Crafts Council, September / October 2011, issue 232, p.62. ill.